“ Thought people might be interested to see this stunning new variety of N. hamata which I recently photographed in Sulawesi. It comes from a mountain quite far away from the type locality of N. hamata and shows that this species has a good bit of geographical variation throughout its range. Compared with the variety from Gunung Lumut (which is probably the source of all the plants currently in cultivation? 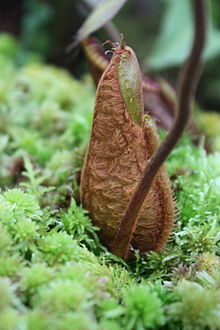 ), the pitchers of this new form are more robust and entirely red with a dense coating of rusty brown hairs. Also, the bristles on the lid are not as numerous nor branched. In all other vegetative respects it matches N. hamata very well. ^ 1.0 1.1 1.2 1.3 1.4 1.5 Turnbull, J.R. & A.T. Middleton 1984. Three new Nepenthes from Sulawesi Tengah. Reinwardtia 10(2): 107–111. ^ 2.0 2.1 2.2 2.3 2.4 2.5 2.6 Kurata, S. 1984. A new species of Nepenthes from Sulawesi, Indonesia.PDF The Gardens' Bulletin Singapore 36(2): 197–200. ^ 3.00 3.01 3.02 3.03 3.04 3.05 3.06 3.07 3.08 3.09 3.10 3.11 3.12 3.13 3.14 3.15 3.16 3.17 3.18 3.19 3.20 3.21 3.22 3.23 3.24 3.25 3.26 3.27 3.28 3.29 3.30 3.31 3.32 3.33 McPherson, S.R. 2009. Pitcher Plants of the Old World. 2 volumes. Redfern Natural History Productions, Poole. ^ 4.0 4.1 4.2 Nerz, J., A. Wistuba, C.C. Lee, G. Bourke, U. Zimmermann & S. McPherson 2011. Nepenthes nigra, a new pitcher plant from Central Sulawesi. In: McPherson, S.R. New Nepenthes: Volume One. Redfern Natural History Productions, Poole. pp. 468–491. ^ 夏洛特. 食蟲植物觀賞&栽培圖鑑. 台北: 商周出版. 2007: 57. ISBN 978-986-124-850-9. ^ 6.00 6.01 6.02 6.03 6.04 6.05 6.06 6.07 6.08 6.09 6.10 6.11 6.12 6.13 6.14 6.15 6.16 6.17 6.18 6.19 6.20 6.21 6.22 6.23 6.24 6.25 6.26 6.27 6.28 6.29 6.30 6.31 6.32 6.33 6.34 Cheek, M.R. & M.H.P. Jebb 2001. Nepenthaceae. Flora Malesiana 15: 1–157. ^ Kurata, S. 1976. Nepenthes of Mount Kinabalu. Sabah National Parks Publications No. 2, Sabah National Parks Trustees, Kota Kinabalu. ^ D'Amato, P. 1993. Nepenthes eymai.PDF Carnivorous Plant Newsletter 22(1–2): 21. ^ 9.0 9.1 9.2 Schlauer, J. 1994. NEPENTHES comments for Flora Malesiana. Carnivorous Plant Mailing List, September 9, 1994. ^ 10.0 10.1 Nepenthes hamata J.R.Turnbull & A.T.Middleton. International Plant Names Index (IPNI). ^ 11.0 11.1 11.2 Jebb, M. 1994. NEPENTHES revision for Flora Malesiana. Carnivorous Plant Mailing List, September 9, 1994. ^ Kurata, S. 1984. New species of Nepenthes from Sulawesi, Indonesia. Journal of Insectivorous Plant Society 35(2): 41–44. ^ （德文） Marabini, J. 1987. Eine neue Unterart von Nepenthes edwardsiana Hook.fil. sowie Anmerkungen zur Taxonomie der Gattung Nepenthes L.. Mitteilungen der Botanischen Staatssammlung München 23: 423–429. ^ （德文） Marabini, J. 1988. Zur taxonomischen Klassifizierung von Nepenthes dentata Kurata und Nepenthes hamatus Turnbull et Middleton. Das Taublatt 9: 4–7. ^ 16.0 16.1 Schlauer, J. N.d. Nepenthes hamata. Carnivorous Plant Database. ^ 17.0 17.1 （印尼文） Mansur, M. 2001. Koleksi Nepenthes di Herbarium Bogoriense: prospeknya sebagai tanaman hias.PDF In: Prosiding Seminar Hari Cinta Puspa dan Satwa Nasional. Lembaga Ilmu Pengetahuan Indonesia, Bogor. pp. 244–253. ^ 18.0 18.1 18.2 18.3 Hansen, E. 2001. Where rocks sing, ants swim, and plants eat animals: finding members of the Nepenthes carnivorous plant family in Borneo. Discover 22(10): 60–68. ^ Phillipps, A., A. Lamb & C.C. Lee 2008. Pitcher Plants of Borneo. Second Edition. Natural History Publications (Borneo), Kota Kinabalu. ^ Heng, S.B. 2013. There's big money in pitcher plants. New Straits Times, July 13, 2013. ^ 21.0 21.1 21.2 "Stairs" 2005. Re: New Hamata like species. CPUK Forum, June 26, 2005. ^ [Anonymous] 2013. BE-3519 Nepenthes aristolochioides x hamata.PDF Nepenthes Growers Newsletter 2(1): 3. ^ Lee, C.C. 2006. Sulawesi Photographs 互联网档案馆的存檔，存档日期2007-09-27.. Carnivorous Plants in the tropics, December 4, 2006. ^ Nepenthes hamata. IUCN Red List of Threatened Species 2006. International Union for Conservation of Nature. 2000. McPherson, S.R. & A. Robinson 2012. Field Guide to the Pitcher Plants of Sulawesi. Redfern Natural History Productions, Poole.